Celebrate the red, white and blue with $4 admission to all visitors at the Milwaukee County Zoo on Wednesday, July 4 (parking fee of $12 still applies). Bring the family for a holiday filled with smiles, laughs and lasting memories, and enjoy both new and “vintage” attractions the Zoo has to offer. While visiting, take a ride on the North Shore Bank Safari Train, stop in to see some old faces at Dinosaurs! A Jurassic Journey, sponsored by Sendik’s Food Markets, or new faces including: a newborn giraffe, and three North American river otters. The train turns 60 years old this year! The original custom-made steam engine was donated in 1958 by the Milwaukee Journal Newspaper. Currently, the Zoo has two steam engine trains and two diesel engine trains, which are one-quarter the size of their full-size counterparts. Visitors will experience eight 4-foot wood sculptures placed near the tracks throughout the woods as part of Wisconsin wildlife. The sculptures are hand carved by Rock on Ice, a company in Ohio, who uses wood from trees that already need to come down. Dinosaurs! 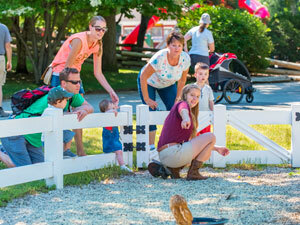 A Jurassic Journey, sponsored by Sendik’s Food Markets, is back for another year. The special exhibit features several new species, including Elaphrosaurus, a fast bipedal dinosaur with a long neck and Suchomimus, a spinosaurid dinosaur with big claws and a long jaw. The exhibit is $3 per person. Say hello to several new faces around the Zoo. The Zoo welcomed a female giraffe baby on May 15 to Marlee, and dad, Bahatika. She was born weighing 174 pounds. Full-grown female giraffes can weigh around 2,601 pounds! Give a friendly welcome to the Zoo’s three other new residents, North American river otters, Emerald, Clover and Shamrock. Otter Passage is located at the new West Entrance, and features two pools, a splash pad, and river area with a 15-foot slide. The kids will be sure to love the artificial hollowed-out tree for an up-close look at the otters’ den. It’s sure to be a lively time! 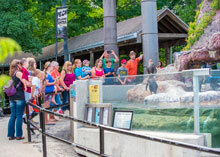 The Zoo is open from 9 a.m. to 5 p.m. on July 4. For more information, contact the Zoo’s Public Affairs and Services Division at 414.771.3040.